It’s been said that I’m an outdoorsman. If I’m not participating in Family life, I’m fishing, if I can’t fish I’m hunting, if I can’t hunt then I’m thinking about fishing and hunting. 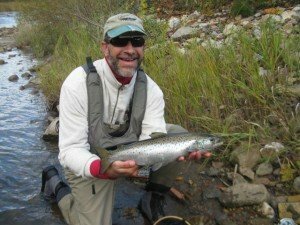 I’m originally from Pennsylvania which is where I started fly fishing while attending Mansfield University, in north central PA., over 25 years ago. I moved to Northern Vermont in 1993 and was lucky enough to have two buddies teach me the art of fly tying. It was that first fish, caught on a fly that I tied, that brought me to this stage in life. Teaming up with Brian Cadoret at Steam and Brook fulfills my mission. Now I can help teach anglers, new to the sport, some basic skills and watch them apply those skills to catch their very first trout on a fly. I can also show experienced anglers new waters in beautiful settings and maybe teach them a new technique or learn one myself.